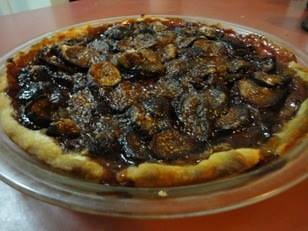 With Fig season almost upon us, this is a delicious pie is the perfect answer. Grease pie dish with butter generously. Place and mold your pie crust into dish. Set aside. Select ripe figs, cut into medallions. Place cut figs into pie dish. In a small bowl, combine cornstarch, sugar, and spice, mix well. Sprinkle evenly over figs. Add lemon, simply squeeze your half lemon over the figs trying to disperse the juice as evenly as possible. Dot the top of the pie with your butter. Bake in a preheated 425 oven for 35-45 minutes until the pie juices are bubbling and the pie crust is dark brown. Garnish with fresh mint OR finely chop fresh mint and add to unsweetened whipped cream and place a small dollop on your piece of pie. *Note, you may want to place a cookie sheet under the pie dish as it may bubble over.